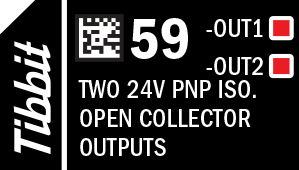 Output transistors are rated for 24V/0.5A. To activate a transistor, set the corresponding control line LOW. When left unconnected, control lines default to HIGH (and, hence, transistors will be closed). There are two red LEDs, which are connected to two transistor control lines. LEDs light up for the LOW state of control lines (i.e. when transistors are opened). 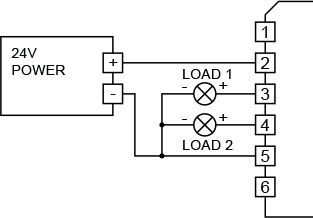 The diagram below shows an external 24V power supply and two loads connected to the outputs of Tibbit #59.